"You can't put a price tag on this program." - Mother of Reading Quest client. Lesa, We've talked about words all week, but I can't think of any that would express my gratefulness. The transformation in Stephen is amazing. The program is wonderful, but it could only do so much. Having you as our teacher has made a world of difference. We appreciate all that you have done for our family. Stephen's life will never be the same. "Dear Ms. Lesa, This letter is for helping me with reading and writing. Before I did not know how to read and write, but now I know how to read and write. I am thankful." Sincerely, Patrick. "After years of trying homework sessions with Lexi, I realized something was seriously wrong. It was very frustrating to her and myself. A friend told me about Reading Quest. I wasn't very convinced, since the school she was at, kept slipping her through the cracks. But I truly needed help. Meeting Lesa was the best thing that ever happened to Lexi and our family. She assessed her within a few hours. We did the program and what a difference. Lexi is a different child. Lesa was very calm and understanding. Her teaching methods are A+. Lexi not only is reading at her grade level, but she understands what she is reading. If she doesn't understand something she knows what questions to ask. Reading Quest and Lesa have saved Lexi years of frustration and tears. Thank you Lesa. You truly do not have any idea what you have done for Lexi and her confidence. We are forever indebted to you and Reading Quest." "Lesa has made a tremendous difference in my son using the Davis program. He now has confidence that he never had before working with Lesa. He doesn't complain about school and has actually started enjoying reading. He enjoyed working with Lesa and even wanted to see if she could homeschool him. She found things that interested him and helped him relate his interests in the program, therefore he became even more motivated. We could see an immediate change in his attitude and his self esteem after completing the program. This program works and is an excellent investment!!" - Mother of Reading Quest client. "This is such an AWESOME program! We are VERY pleased with our daughter's results. She began her program reading at an 8th grade level and by the end of the week she is now at a 10th grade (independent reading) level! It is simply AMAZING! Her confidence and self-esteem are off the charts! She's actually looking forward to returning to school. We feel so blessed to have found Lesa Hall and having her work with our family. Reading Quest WORKS!!!" - Mother of Reading Quest client. At Reading Quest, clients learn how to master abstract words and concepts. 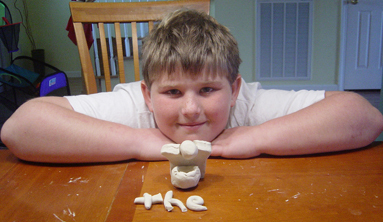 Using clay is a fun and creative way to learn! It is never too late to overcome dyslexia! The Davis® programs are highly effective for adults, too!